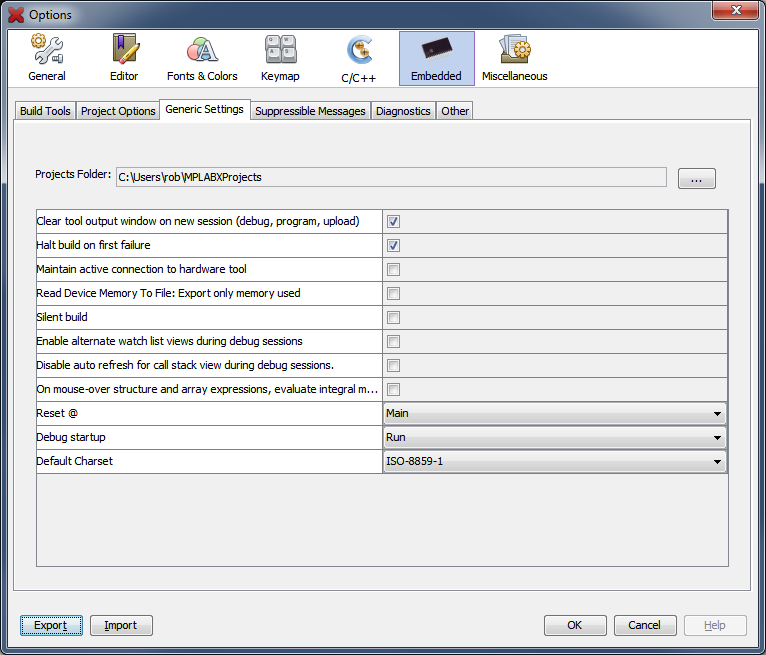 The Generic Settings tab of the Embedded category contains settings for the location where new projects will be created by default, as well as a list of options that direct MPLAB® X IDE's behavior during the build and debug processes. This setting determines which directory will be used as the default save location when you create a new project. By default, the location is a folder called "MPLABXProjects" that is automatically created in your user directory. The user directory location varies by operating system and in the case of Windows the operating system's version. Clear out the contents of the Output window when you begin a Run, Debug Run or upload. When building, halt the process on the first failure. The selected project language tool can be set up to determine which errors are produced. Go to the Project Properties dialog and select the language tool under “Categories”. Then look for through the Option Categories to find one that allows you to set up errors, warnings and/or messages. If selected, keep hardware tool connected always, not just at runtime (MPLAB IDE v8 behavior). When switching projects with this option selected (e.g., when developing bootloading applications), ensure tool and device are the same to avoid error messages. Build without generating messages in the Output window. Display three watch view diamonds in the Watches window. Associate a watch view with a watch variable. When you click on a watch view diamond, only the variables associated with that view will be displayed. So this feature works like a filter. Main: Stop at main() on reset. Reset Vector: Stop at the Reset vector on reset. Select action on debug start. Reset Vector: Stop at the Reset vector. Select the default character set for the project.